Every woman surely wants to own a walk-in closet like the ones in this list. It is the dream of every woman to have their own walk-in closet wherein they can keep all clothes, bags, shoes and jewelries. It will also be nice to see all those stuffs organized together in a single space. Plus, it will make one feel like a star with all the stuffs lined up in the walk-in closet. Shelves, drawers and even boxes could also be added decors to the area apart from storing the items that a woman owns. 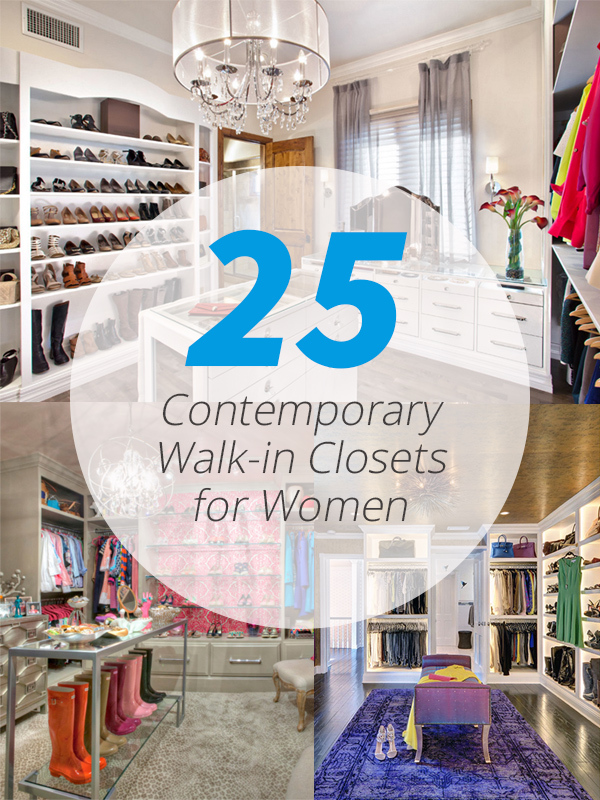 With that, we have collated 25 contemporary walk-in closets for women so that if ever you are planning to have one in your home, you can get ideas from what we have in the list. Aside from storage spaces, you can also add seating, lighting and even decors in the space just like what we will see in the images below. 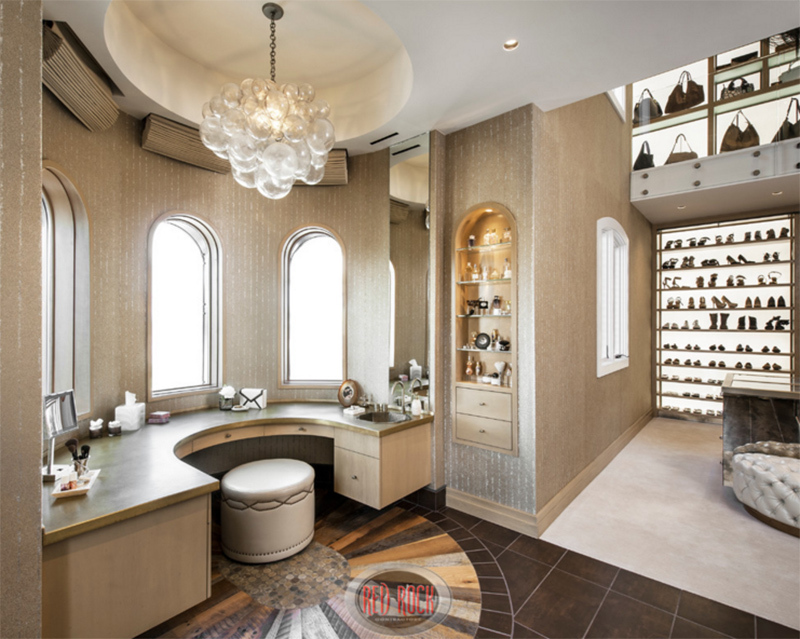 A bedroom that was transformed into a glamorous walk in dream closet with custom built cabinets designed for the owner’s needs. It has dresser drawers wherein the left side hold delicates and the top drawer are for clutches and large jewelry. It also has a center island which is a jewelry case with a built in bench on the side facing the shoes. Yes, you can also use a rack like the one show here and add some chairs and area rug. This can already be a perfect walk-in closet depending on the number of storage space you need. I love the ottoman and the crystal chandeliers in this walk-in closet. Also, the cow hide adds to the areas sophistication. It also looks great because of the glass doors and shelves. In truth, this walk-in closet is something we can all achieve as long as we have a space in the house. Sometimes, it is just a matter of arrangement! This closet is designed by California Closets featuring many shelves and hanging areas. The use of wooden finish add appeal to the area as well as the lightings too. A pretty small walk-in closet wherein the island has a built-in seating. With that, you can sit while putting shoes on or while looking for the perfect accessories from the drawers in it. Above it is a lovely crystal lighting. A closet that is said to be every stylist’s dream wherein the center of the room is an island filled with pull out trays for jewelry. On the sides of the closet walls are intended for short and long hanging and all of these are adjustable so the space can change as one’s needs change. A simple design for a walk-in closet which will surely make it easier for you to look for the items that you want to wear from bracelets to shoes. What added appeal to this walk-in closet are the walls because of the colorful wallpaper that covers it. It is also a good idea to add a tall glass table in the center wherein the jewelries area added and gum boots were stored just below it. I love the idea of having a central island storage for jewelry. What is nice here is that it also has a space for eye wear too! And of course, that lighting is marvelous! A small closet that appeared spacious because of the tall mirror and the glass doors. Aside from that, even the legs of the bench is made from transparent material as well as the lighting too. A neat contemporary walk-in closet wherein the central island has a pink countertop. The cabinets are all in white that compliments with the dark wooden flooring. You can also add some chairs in the walk-in closet as well. You can see that it has a countertop made of marble as well as drawers with silver decorative handles. Patterns are also seen here which doesn’t look distracting. One look at this made me think that this is a part of a shopping mall because of its lighting and colors. That tufted ottoman looks really nice as well. This is a good idea for a walk-in closet that features cabinets with doors. This one looks interesting as some glass features are added to it to compliment with the wooden cabinets and drawers. What I find intriguing here is the toilet inside the walk-in closet. This one used white cabinetry and has plenty of shelf space that makes for a clean and contemporary closet. You can keep your space organized with dividers and pull out drawers. If you want one with doors, this would be a lovely idea by using mirror for the doors and drawers. Very nice, right? This one doesn’t look too spacious but it looked big because of the mirrored doors and the lights that were added to the cabinets. I like it that they used a lovely purple carpet with some complicated design just below the purple chaise. Such a sophisticated space indeed! If you want to hide your walk-in closet, it is just easy to slide the door and hide all your treasures away but if you want to show-off, it is easy to slide it open too. Just outside the closet are some chairs where you can sit and relax. I like it that they used glossy glass finish for the drawers and I like it even better that it used pink for it! It looks nice with the wooden features too. A closet that features a clean modern feel and also has a color that is practical since it does not show dust easily. If you have a smaller space, this could be a good idea. A contemporary walk-in closet with a vanity in a curved style. On one side there is built-in storage with glass shelves. Another thing I noticed here are the bags in the upper side. I guess this one has a mezzanine! The frame of the mirror adds more beauty and glam to the area. On both sides of the walk-in closet are drawers and shelves for shoes, bags and others. You can also add a wallpaper to your closet to give it a lovely appeal just like this one. There are various storage spaces seen here too. I know. I know she looks pleased because why she has all the reasons to flash a smile! Just look at all the beautiful shoes and bags and clothes she keeps in this closet! It is indeed what every dreams to own! 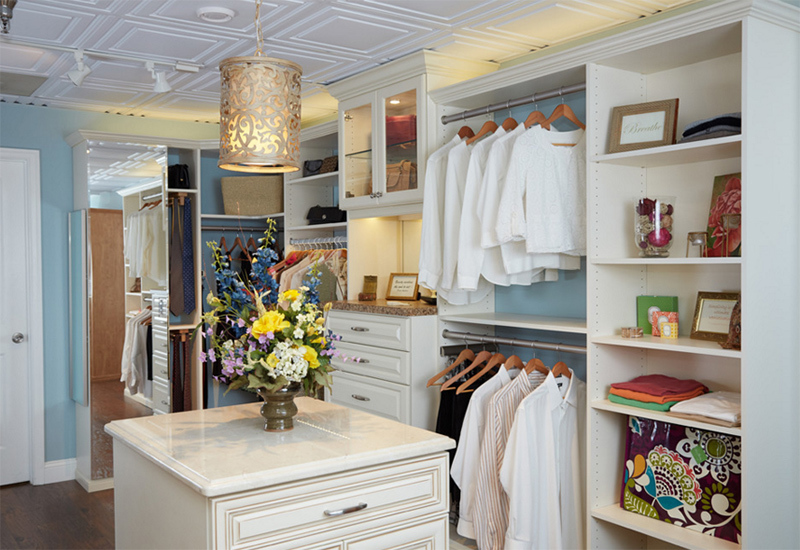 It would certainly be nice to have a walk-in closet where you can keep every valuables you have from jewelries to bags. And you will feel like you are a superstar when you have one! Also, it would be easier to choose which to use since everything is well-arranged. But aside from these walk-in closet for women, there are also some for men too and for sure, even men will be able to appreciate how useful a closet could be! How about you, are there certain features that you want to see in your closet? Share that to us in the comment section below.